The name "Viking" is derived from the Old Norse feminine noun that meant a trip overseas. It could be found on runic inscriptions from the Viking Age, as well as in the medieval documents, where the phrase "fara í viking" was used for example, meaning the departure on an expedition. In the Icelandic Sagas, the phrase "go on viking" was synonymous with the participation in a piracy and plundering expedition. From this expression, the word "víkingr" is derived, which is an Old Norse masculine noun, meaning a sailor or a warrior taking part in the overseas expeditions. It appears often in the Scalds' poetry and on the rune stones' inscriptions, which are found around Scandinavia. A Viking sword occurred on the Scandinavian peninsula in the early Middle Ages. The first found swords of this kind come from the seventh century AD most probably. They were used up to the eleventh century, when because of the territorial expansion and the resulting cultural integration, it became subject to change. It was the time when the Vikings (Northmen, Normans, Scandinavians) converted to Christianity and settled in almost all parts of Europe. The specified time-frame is based on two significant historical events associated with the Vikings. In 793 AD, the Viking attack was mentioned in the text for the first time. It was when they robbed the English convent located on the Lindisfarne island. The second crucial event was the Battle of Stamford Bridge in 1066, when the Norwegian king Harald Hardrada, who was called the “last Viking”, was slain by Anglo-Saxons. In the Viking Age, every free man could carry a weapon. This was an era in which a war was not just the domain of kings and the nobles. Every person, regardless of the social class, could be called upon to defend his king or chief, or forced to participate in raids or to wreak vengeance on those who hurt his family. The Viking army consisted mostly of the infantry, but it had also some horsemen. However, they occurred rarely, so did the naval battles. 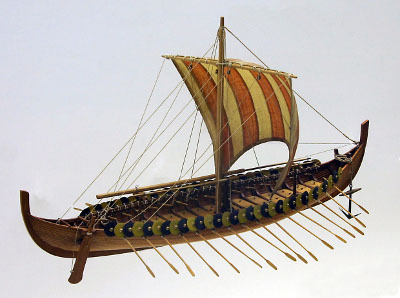 The main function of ships was to transport the troops to the place where a land battle was supposed to take place. As it shows from the found French and English sources, the Vikings were characterized by great strength and outstanding battle skills. The weapons which were most commonly used by them and brought real terror were swords, axes and spears. The Viking sword was the most appreciated, because of its power and status symbol – the quality of a sword was associated with the social position of a warrior. The hilts were incredibly elaborately decorated, and a double-sided blade (70-80 cm long) was surprisingly flexible and light, at the same time being exceptionally sharp and strong. It happened that the swords were brought from France, but the hilts were made in Scandinavia, applying the ornamentation associated with the Viking culture. The blade was based on the core formed of a braid of long metal strips, which slightly differed in composition. By welding tougher and harder cutting edges made of steel, the weapons were enhanced with amazing efficiency. Finally, the sword was polished and on its entire length a groove was minted. Thanks to this process, the blade was light and flexible, while remaining extremely durable. Sheaths, used for carrying swords, were made of wood coated with leather and had a fleece padding inside. When it comes to helmets, lanolin was used, as it was a great protection for the metal against corrosion and tarnishing. For the best swords, special sheaths were prepared. They were enriched with lavishly decorated, gilded or bronzed handles at the opening and at the end. In hand-to-hand combat, the Vikings relied mostly on double-edged swords, inflicting very severe wounds; and also short, one-sided knives, which could be used for piercing enemies. The Viking swords were one-handed weapons reaching the total length of 80-100 cm. They had two-edged and symmetrical blades, straight or gently tapering to short, usually oval foible. They did not weigh much, usually 900-1200 grammes. They had a short, solid, straight or slightly bent down hilt and a decorated cross-guard, tightly wedging the hand. It is hard to determine the composition of the Viking swords and the process of their preparation precisely, as the finds are usually highly contaminated, and the metallographic research is generally not one of the easiest. Nickel was identified in the blades for example, what raises the assumption that they were made using the iron gained from meteorites. The blades from between the seventh and eighth centuries are said to have the best quality. A distinctive pattern that can be noticed on them was created by forging at least two different types of steel. It is possible that the Vikings adapted this technique from the Middle East, because the traces of their presence were also found there. It is possible that it was where they mainly imported steel from, but it is rather assumed that most of the weapons were created in the domestic area. The territories of the current Norway and the Scandinavian peninsula are generally the richest in finds of the Viking weapons, including swords with the ULFBERHT inscription. However, in fact they occurred in most European countries. The ULFBERHT swords do not contain a trace of combining different kinds of iron or steel on the blades. In the area of today's Germany, there were centers of the weaponry production, which the Vikings could also take advantage of. The inlaid metal inscriptions on blades with Latin alphabet were developed since the eighth century. On the other side of a blade, usually there were groups of lines or plaited ornaments. The word VLFBERHT (ULFBERHT), found surprisingly often on the blades, has Frankish roots and its meaning remains unknown. There are theories saying that it is a combination of the words "wolf" (from the old Norwegian “ulfr”) and "light, glare" (from the old Germanic and old Saxon “behart”); or that is the name of a blacksmith which became his kind of a logo, often counterfeited. Pic. 4 Viking sword typology heads. The cross-guards and blades of the Viking swords are one of the most elaborately decorated ones in all the cold steel history. However, it was not a rule, as some of them had purely practical function and did not carry any ornaments. If the decorations were present, they were made by smithery, inlays or engravings. It happened that those methods were combined. The decorations could have the form of simple and repetitive geometric patterns, as well as braids or images of humans, animals or gods. They were mostly made of copper, gold, silver or steel. The Viking craftsmen and artists were real masters of weapon ornamentation. Lots of these decorations have survived to the present, while the remaining part of the sword have been often destroyed with corrosion. In the GlobalReplicas online store you can find the most precisely prepared Viking weapons' replica. They reflect the great artistry of the originals, so you can fully appreciate the mastery of ancient swords craftsmen who were able to make them so minutely already many centuries ago. Such an amazing replica of a sword will impress every collector, a history lover and not only, so it is a perfect idea for a gift. 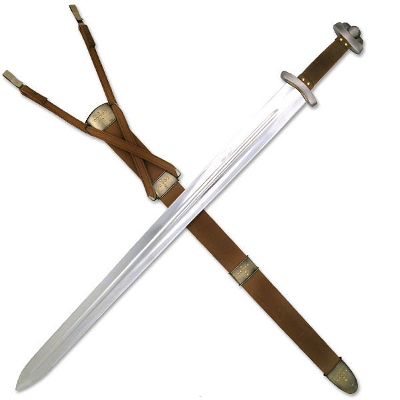 A sword replica will look incredibly in every interior, making it more exclusive and elegant.